Roger's pictures of the derailment south of Anderson brought back some cold memories. The Michigan Division in its 300 mile journey from Benton Harbor, Michigan to Jeffersonville, IN had about 5 weather belts that ran from 5 and 6 ft. of snow on the north end to dry ground, (until 1963), on the south end. To explain the 1963, until that year for myself at least from 1950-1963 I never saw snow at Jeffersonville. 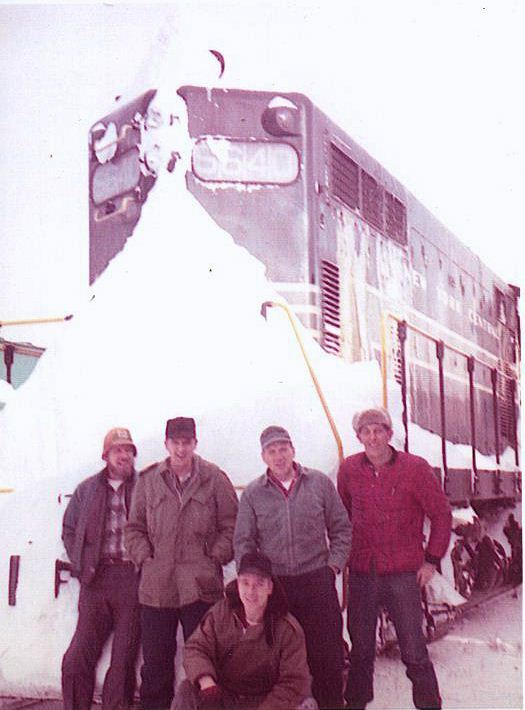 In that year they had 9" and we came in on a train, put it away in the yard, and stayed on the engine for 8 hrs before we could get to a motel. When you don't have snow you don't need snow equipment, you could not buy a snow shovel because stores did not keep them. The snow capital was between Niles and Benton Harbor, Michigan. Because of its location to Lake Michigan you were always getting lake effect snow on this 25 mile piece of track. Snow would drift from 3 to 6 ft. all winter and it would snow about every night so it was a fight every day. 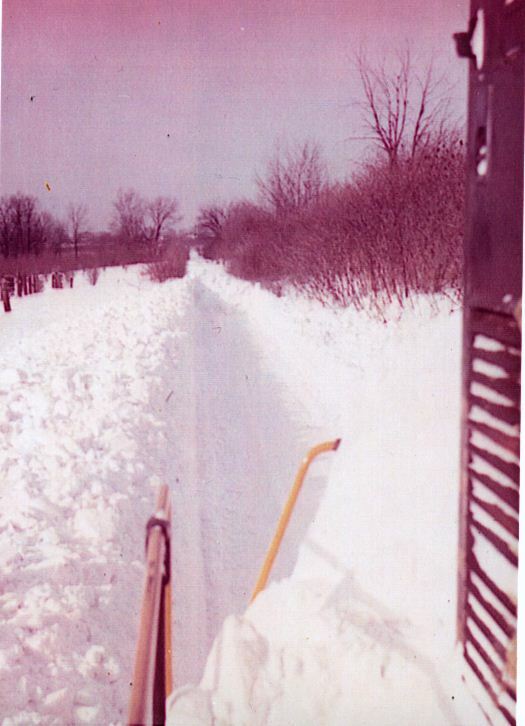 Here are 2 pictures of the snow in the sixties and it was 5 ft. at that location between Eau Clair and Sodus. When you come to these drifts you would go until you stopped and back up and hit it again until you broke through. As you can see in one of the photos the snow piled up on the nose. Most of this had to be cleaned off because that end coupled to the train on the return trip. They did send a trackman with you to clean out switches and side track crossings. This lasted until the job was taken off in the late 70s. The thing that changed the job more than anything else was when they did away with the walkways on top of the cars. With the walkways on, a snow plow was only used as a last resort. After you had cut your way through and started running 30 mph and as you pulled your train through the cuts the snow would lift the cut levers and the train would come apart. The brakeman from the engine or caboose would walk over on top of the cars and couple the train together. Then walk back over the top of the cars and we would leave. The drifts might be 4 or 5 ft deep where the train came apart and you can't walk on the snow that deep and take a chance of falling through. After they removed the walkways if the train become uncoupled you could not recouple in the drifts. After that they always run the snow plow when you had a major snow. 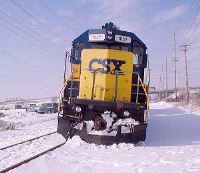 Charlie Downing was the engineer after a heavy snow, with 3 units and 27 cars and plowed into a drift and couldn't move. They sent 2 units to help and they could not move the train. Taking the train back to Niles and returning the 5 engines couldn't move themselves so the trackmen had to dig out the three engines by hand to get them out. 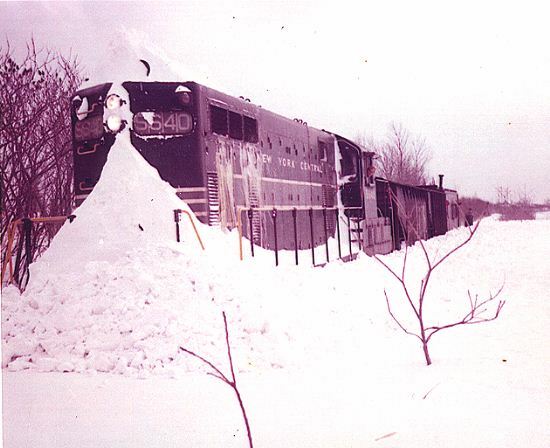 When the snow was 8 to 10" above the rail and with a geep the snow would slide up the front of the engine like a snow plow and you were running blind for maybe 2 miles. On those old geeps the snow would come in the hood hit the heater and make steam and it would get so bad you could hardly breathe and you couldn't open the windows because of all the snow flying around outside. During the day it would warm just enough to make the snow soft and the highway snow plow would come across the crossing and leave about 3 ft of snow on the crossing and it would freeze. The next day we would hit the crossing at 30 and you could feel the engine raise up on the front end as we hit the drift at the crossing. Those were just a few things, but working the Niles BH switch run was a Bear in the winter.